Following a lead on a fellow writer's blog, Sally Jenkins' blog, in which she mentioned a Debut Novel Competition, I decided to submit Save The Last Dance For Me. There's no entrance fee (highly unusual!) so why not! Another disappointment - but in company with royalty! Well, I heard back fairly quickly from the publisher I sent a synopsis and three chapters to of Save The Last Dance For Me. Unfortunately, they said no. However, one spark of hope was that this time it reached the commissioning editor for consideration. On to the next publisher on my list! 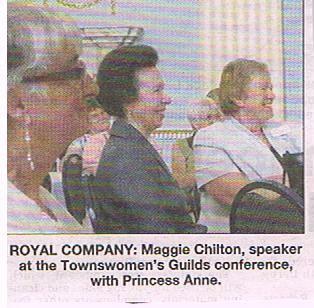 The disappointment was tempered quite well by the fact that my photograph appeared in our local weekly newspaper, the Derbyshire Times, and it looks like I am sitting at the same table as Princess Anne. In fact, we were at adjoining tables! It was also featured on the Derbyshire Times website. I would like to have posted the link but no doubt the web page will have changed by now. I'll have a go at scanning the pic in then adding it to a blog. The other bit of news is that I have started on the redraft of my new novel. I need to get that done in the next few weeks in order to submit it to the Romantic Novelists' Association New Writers Scheme. Someone actually said to me 'Why bother writing another one when you haven't sold the first one yet?' The answer is simple, I can't not write! I always have to have some project or another on the go. And as long as I continue to enjoy writing, what harm is there? You never know, I could end up selling the first one on the back of the second one! One lives in eternal hope.